The Amcrest IP2M-841 and the Yi Dome Camera 1080p are both very popular indoor 1080p cameras that can pan and tilt, allowing them to see all around and room they are placed in. These two models have some interesting differences, so keep reading to see what sets them apart from each other and why you might choose one over another. Both of these cameras use a 2 megapixel image sensor that's 1/2.7" in diameter, which is a good large size for inexpensive consumer cameras like these. The 2MP sensor gives us full HD resolution at 1920 x 1080 pixels for each camera. The big difference between these cameras is that the Amcrest says that it is capable of video at 30 frames per second, but the Yi says it can only do 15 frames per second. While 15 fps is normally just fine for security camera use, I have to wonder about any devices that aren't capable of 30 fps at 1920 x 1080. When something can only do 15 fps at that resolution it makes me question just how up to date the technology inside is. The Amcrest uses a 4mm lens which gives it a 90° field of view, and the Yi uses a 2.6mm lens which gives it a 112° field of view. Many people seem to like that wider field of view, but keep in mind that you will be able to see less detail when you're covering a larger area all at once like that. One of the main reasons for a motorized camera like these is so that you don't have to try to see everything all at once. Both of these cameras can be remotely controlled to pan left and right, and tilt up and down. They both have a large enough range of motion that you should be able to remotely point them to see pretty much any part of a room no matter where you place the camera in the room. The Yi has some additional software features that go a little further with the pan and tilt functionality. You can set up to 8 presets, allowing you to instantly point the camera to one of eight different positions that you have set. The Yi also has an auto-cruise function, so you can set it to scan around the room by itself. Both cameras can use the image sensor to detect motion and send you an alert, but the Yi can take it one step further if you want and use the pan and tilt to try to track the motion around. This is one big area that sets the two cameras apart. Both have the ability to see in complete darkness, but with one big difference in the particular technology used. The Amcrest IP2M-841 uses twelve of the common 850nm wavelength IR LEDs with a rated usable distance of 32 feet. These are the same types of IR lights that most cameras use, and while most of the light they produce is invisible to the human eye, enough falls in the visible spectrum that you can see that they are on because they give off a dull red glow. They are not very discreet at all, and people will notice them in the dark. The Yi Dome Camera 1080p uses eight of the not so common 940nm wavelength IR LEDs instead of the common 850nm ones. This reduces its rated usable distance down to 26 feet, but you gain something that many people like in exchange. These lights are completely invisible to the human eye, so the camera will be much more difficult to detect at night. Both cameras can connect using your 2.4 GHz WiFi, and neither of them can use 5 GHz WiFi. The Amcrest can also connect to your wired Ethernet network if you want where the Yi cannot. You must have a 2.4GHz capable iOS or Android mobile device to setup and use all of the features of the Yi camera. An internal microSD slot is included with each camera, but the Amcrest supports up to 64 GB and the Yi only supports cards up to 32 GB. Both vendors offer their own cloud storage options for a fee. You can try it for 30 days with the Yi but then it stops if you don't pay. Amcrest does offer a free plan that you can keep using, but it's very limited at only a few hours of video per month for one camera. Plan on paying some money each month if you want real usable cloud storage from either company. The Amcrest also supports more advanced storage options like Amcrest or other ONVIF compliant NVRs and also FTP, where the Yi does not support anything like this. A built-in speaker and microphone on each camera let you listen to audio picked up by the camera, and also talk through the camera like an intercom using the camera's mobile app. Both seem to do this well and it's fun to talk to your pets or people using this feature. The Amcrest also has the option of connecting an external speaker and mic if you need to. 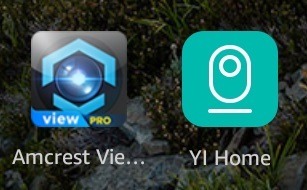 Amcrest and Yi both have full-featured applications for iOS and Android. They both also offer Windows and Mac apps for viewing video. Yi has added some interesting features to their software that some people may be interested. I already mentioned the pan / tilt position presets, auto-cruise, and motion tracking above. The Yi also has a feature to detect a baby crying and alert you, but on the other hand many reviewers report that the app will shut down after running for a couple of hours, which isn't so good when you're trying to use it as a baby cam. After reading many reviews and comparing these two cameras in detail I can see why someone may choose one over the other, and which one you pick will depend on what's important to you and how you plan to use it. IF you want to consider a third option, take a look at my comparison of the Amcrest IP2M-841 to the Foscam R2 1080p camera. Click here to view the Amcrest IP2M-841 at Amazon! Click here to view the Yi Dome Camera 1080p at Amazon!